If you're a human being with a smartphone and a decent wifi connection, you'll already know about what I'll call "Mike Pence getting booed at Hamilton"-gate. This is the headline that refuses to die, mainly because none of the parties involved can stop tweeting about it. 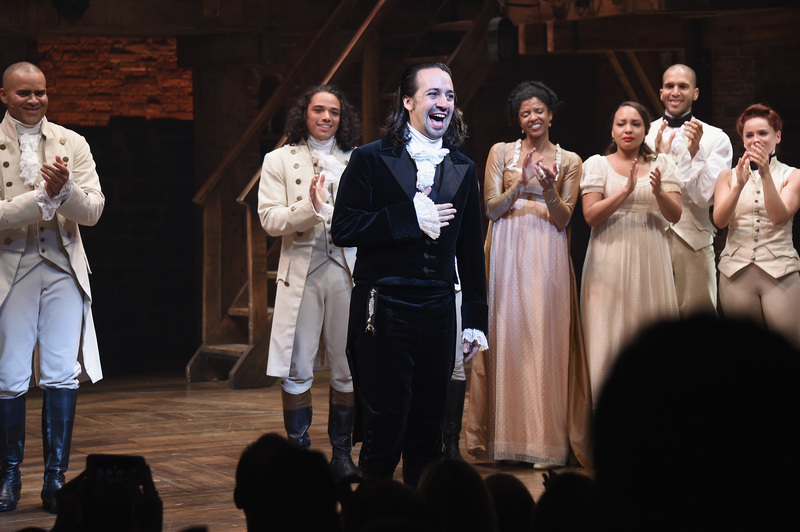 Following Brandon Victor Dixon's rousing speech to Pence, Donald Trump tweeted his outrage and Lin-Manuel Miranda tweeted his support. If there was ever a time to give the Hamilton soundtrack a re-listen, it's now. But before you do, you're going to want to check out Hamilton lyrics that feel timely right now. They're not just timely because of the Pence debacle, however. Following Trump's controversial appointment of Steve Bannon to one of the highest ranks in government, it might feel like the world's going to hell in a handcart. In these uncertain times, political activism is more important than ever and getting inspired by Hamilton is half the battle. Don't guffaw. Sure, that sounds a little pat, but think of it this way: given Hamilton 's championing of immigrants as not just necessary, but downright vital for the American Revolution, the musical is a rich source of inspiration about battling prejudice and celebrating the very thing that makes America great: the diversity of its citizens. We've got a long, hard fight ahead of us and it's going to be important to stay inspired and resist apathy. So get that Hamilton soundtrack on loop: You're going to need it. If you weren't into political activism before, it's time to get involved. Apathy is no longer an option. Trump's policies are frightening, because they imply changes to America that will endure long past his presidential term. As the only world leader to deny climate change is real, if Trump scraps the Clean Power Plan and backs out of the Paris climate change deal, that won't just affect America, but the entire planet. His statement following the November 2015 Paris terrorist attacks, where he said the U.S. government should close mosques where “some bad things are happening,” implies an attack on the First Amendment of the constitution (and there's been evidence he's also opposed to the Eighth and Fourteenth Amendments) — so he may very well set a precedent for disregarding the constitution, if he forces through everything he vowed on the campaign trail. I could go on. The point is, if you don't want your children to be living in a world that's been shaped by Trump's policies, you need to start fighting now. Trump's comments about women have been problematic, to say the least. Feminists, let's step it up a gear. Because, according to novelist and screenwriter Jesse Andrews, the election was as much about storytelling as it was about policies — Clinton's story seemed too diluted and nuanced to be truly arresting. Liberals need to learn how to craft a more straightforward narrative. Sure, you might feel outnumbered and overwhelmed right now. But as in Hamilton's America, and so too with Trump's: Immigrants are America's lifeblood. It does. Because this doesn't "just" affect America, but it affects the whole world. Not just catchy: true. The Wall Street Journal reported on a study about immigrants in September and wrote, "Waves of immigrants coming into the U.S. in recent decades have helped the economy over the long haul." The importance of being in the game and not just waiting is a subject that was also addressed this week in tweet-form and made me wet my pants a little in terror. This sounds eerily similar to Miranda's response to the vice president-elect getting booed by the audience when he went to see Hamilton. It's almost like Miranda isn't just a talented composer and singer, but a psychic, too. Because given the tide rising nationalist and xenophobic sentiment across the globe, this is going to be a long battle. So we can't base resistance on results: We have to have the stamina to see this thing through even when it feels hopeless. It may not feel like it right now. But while this is the year Trump was elected, it was also the year Kamala Harris became the second black woman to be elected to the U.S. Senate. Since Harris' mother is Indian, it also marks the first time an Indian woman has been elected to the Senate. Besides which, Ilhan Omar became the first Somali-American Muslim woman to serve as legislator, while Nevada's Catherine Cortez Masto became the first Latina Senator to be elected. Finally, Washington's Pramila Jayapal became the first Indian-American woman to be elected to the House of Representatives. Did I say this before? Am I repeating myself? Ho hum, it feels like this needs to be stressed: We're all individually responsible for the politics of the U.S. If this wasn't the election result you were hoping for, what are you going to do about it? In a political climate where marginalized communities are being threatened, it's not enough to be neutral anymore. I'm not advocating for aggression, but respectful defiance and alliance. Stand up for someone if they're not feeling safe. Make a donation. Go on a protest. Phone your representative. So sure, watching Hamilton may not start an overnight revolution — but reading through these lines when you're feeling at your most hopeless or apathetic could be a good start. Let's make 2017 the year American political activism became every bit as ambitious as what we've witnessed in Hamilton.